Danny Girl Designs is a women-run family business based out of Tarpon, Florida. It turns out, plaid was not always plaid as we know it today. Tartan is the technical name for the pattern. NY Wholesale Scarves is an international supplier of scarves, ponchos, hats, leggings, dresses, and accessories. OFFPRICE is an order-writing trade show that provides buyers a range of major label and non-branded goods at prices 20 – 70 percent below regular wholesale rates. Erik & Mike is a wholesaler of handmade, fairly traded jewelry and accessory items. PursePros, offers a complete line of fashion handbags, backpacks, men’s bags, duffle bags, and canvas messenger bags and backpacks. Wholesale Fashion Inc. carries an extensive inventory of attractive and trendy jewelry and other fashion accessories. Filed Under: Supplier Zone Tagged With: fashion accessories, jewelry, Wholesale Fashion Inc.
RC Jewels specializes in hip-hop jewelry and tracks what the biggest hip hop and rap stars are wearing. 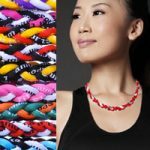 FLASH DEAL: Special Offer on Hot Selling Titanium Health and Sport Necklaces!